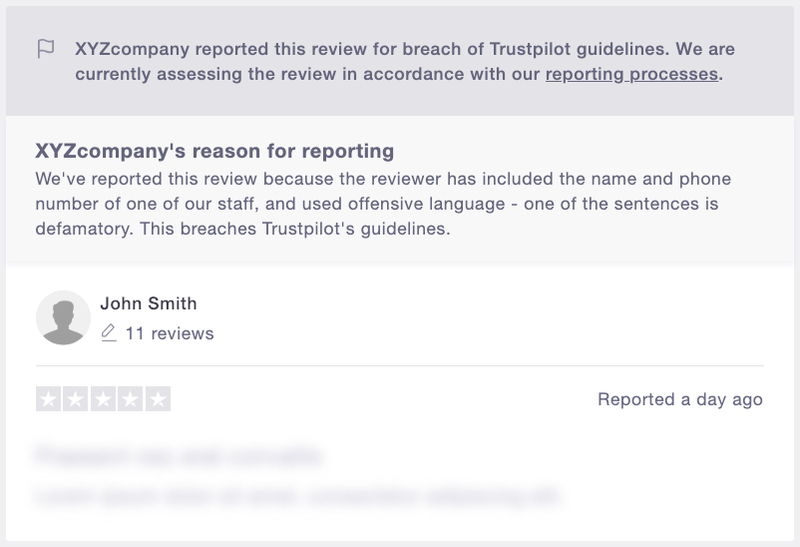 Reviews can be reported if they violate Trustpilot's guidelines, but if the problems identified can be addressed, we're happy to reinstate them. We want Trustpilot to have as many genuine and helpful reviews as possible. To maintain trust, we allow people to report reviews that contravene our guidelines. But we also balance this by requiring the person reporting to explain exactly which guideline has been contravened for each reported review, and a prohibition against abusing this tool. Where possible, our Compliance Team will work with reviewers to help them get genuine reviews back online. Companies can report reviews that contravene Trustpilot’s User Guidelines (US version, UK version). This tool is available to all businesses, regardless of whether they subscribe to our paid services or not. But companies also have a responsibility to report reviews correctly, and only report reviews that violate the User Guidelines. We make it clear to companies what they can report for here. Note that you'll still be able to see your review in full if you log in to your user profile. Remove the review from Trustpilot. This will only happen if there's no way to address the problem(s) highlighted in the company's report or if the edits requested are not completed to make the review compliant. You'll also be sent an email letting you know that your review has been removed. If we contact you to edit your review or provide documentation to verify your buying or service experience, we’ll give you 7 days to reply. If we don’t hear from you, your review will stay offline but it won't be deleted. If you respond to us at a later date, we can restore your review. If you send us the necessary documentation or edit your review to address the problems identified, we'll put your review back online and let you know. We'll also let you know if more information is required. Other reviewers can notify us if reviews fail to comply with our User Guidelines. We call this our "Notify Compliance Process". 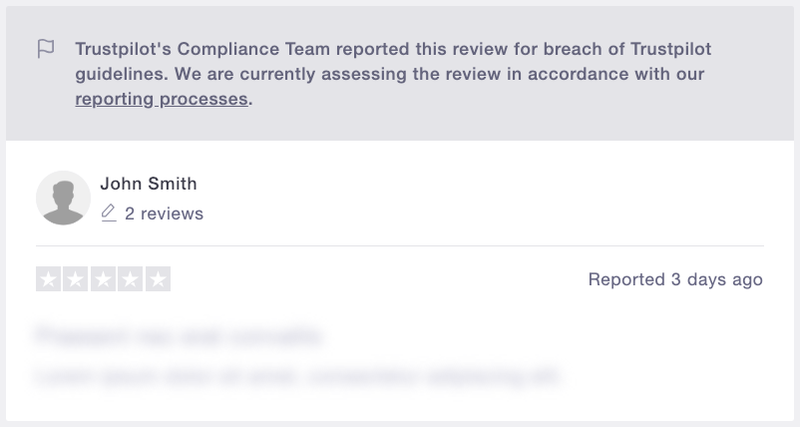 Reviews that we've been notified about stay visible on Trustpilot while our Compliance Team investigates. You'll still be able to see your review in full if you log in to your user profile. Remove the review from Trustpilot. This will only happen if there's no way to address the problem(s) highlighted. You'll also be sent an email letting you know that your review has been removed. If you send us the necessary documentation or edit your review to address the problems identified, we'll put your review back online and let you know. We'll also let you know if we need more information. Why does it take so long to handle reported reviews? Over a million reviews can be posted on Trustpilot in a month, and even if only a small percentage of these are reported, that's a lot of tickets for our Compliance Team to handle! We address each report as quickly as possible, but if more information is required from you or the reviewed company, the process can take time - especially because we usually allow up to 7 days for people to respond to our requests. The ratings attached to a review count towards a company's TrustScore unless the review is removed. This means that the ratings attached to reported reviews still count while we assess and/or address the report. We use advanced, customized software to scan the reviews in our community and detect violations of our guidelines or reviews whose authenticity cannot be verified. A number of reviews are removed automatically by our software. If this occurs, you'll be sent an email notifying you that your review has been removed. You'll also be given the opportunity to contact us if you believe there's been a misunderstanding.